Taoiseach Leo Varadkar has said the Government was "profoundly shocked" at the death toll and scale of injuries that have been inflicted by Israeli forces on Palestinian demonstrators in Gaza. He said Tánaiste Simon Coveney summoned the Israeli ambassador to Iveagh House this morning to express the Government's, and the Irish people's, outrage and dismay at yesterday's events. Mr Varadkar said Mr Coveney directly requested that there will be an independent international investigation into what has happened, as called for by the UN Secretary General. He said: "Any country is entitled to defend its borders, but the use of force must be proportionate to the real threat and these protests may not have been 100% peaceful but there is no indication that the scale of the threat could have justified such violence and so many deaths." The Taoiseach said live ammunition should not be used for crowd control and the Government supported the UN security council's call for an independent investigation. Sinn Féin's Pearse Doherty spoke of the "terrible atrocity" where live ammunition was used against unarmed Palestinians. He said it was "shameful" and said that the Tánaiste should have told the Israeli ambassador to "pack his bags". Mr Doherty pointed out that the Taoiseach acted quickly in expelling a Russian diplomat after the Salisbury attack and asked the Government to take action. He also asked Mr Varadkar to withdraw Irish diplomats from Israel. This morning, Mr Coveney summoned the Israeli ambassador to a meeting to express Ireland's outrage at the level of death and injury in Gaza yesterday. The meeting took place ahead of Mr Coveney briefing the Cabinet. He told the Dáil this evening that he expressed to Ambassador Zeev Bokar in the strongest possible terms his view of the recent events in Gaza. Mr Coveney said he told Mr Bokar that the Government would support moves at UN level to establish an inquiry. He said Ireland supported a two-state solution and unless that happened Ireland would not be moving its embassy to Jerusalem. "I call on all other states to abide by the international consensus and not to establish diplomatic missions in Jerusalem at this time," he said. 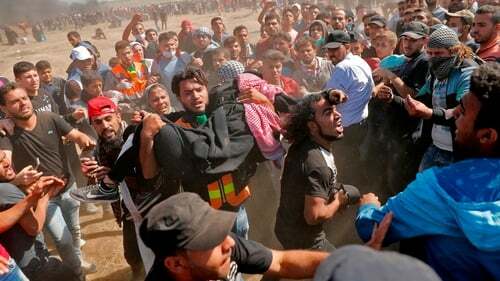 In the bloodiest day in the Israeli-Palestinian conflict since the 2014 Gaza war, at least 60 Palestinians were killed and more than 2,200 were wounded. Opening the week's business in Leinster House, TDs observed a minute in silence in the Dáil as a mark of respect for those who died yesterday. Ceann Comhairle Seán Ó Fearghaíl described the events in Gaza as "horrendous activities". Earlier, Fianna Fáil TD Darragh O'Brien described yesterday's actions by Israeli forces on the Gaza border as "an outrage and a massacre". Sinn Féin leader Mary Lou McDonald said the Government should send the Israeli Ambassador home and recall Irish diplomats from Israel in protest at yesterday's events. Labour leader Brendan Howlin has said the European Union should act against what he described as the slaughter along the Gaza border. He said an emergency meeting for European ministers should be held, and the Government should formally recognise the decision of the Dáil and recognise the state of Palestine. The Social Democrats has said the Tánaiste should push the EU to impose trade sanctions against Israel. Co-leader Catherine Murphy described yesterday's killings in Gaza as "unconscionable" and said there has to be a consequence for Israel. Around 300 people gathered on Dublin's O'Connell Street to protest against the recent violence in Gaza, while a further 150 gathered for a similar event in Galway's Eyre Square. Speaking at the Dublin protest, Lord Mayor Mícheál Mac Donncha called for the expulsion of the Israeli Ambassador. He said he was opening a book of condolences at the Mansion House tomorrow "in solidarity with the people of Palestine".